Large ColdCure® Body Wraps are designed to relieve the pain and swelling of large area injuries. Muscle, ligament and tendon tissue injuries can all be treated with our largest ColdCure® Wrap, the ColdCure® Large Body Wrap. ColdCure® Large Body Wraps are designed to provide relief for larger areas of the body. The gel packs inside the wrap will fully cover any injuries you are experiencing. The dimensions of the effective treatment area are massive and greater than 15"x15". Every Large ColdCure® Body Wrap includes 2 large gel packs that are designed for use on many parts of the body. The unique design of each gel pack ensures the best treatment and coverage possible. The Large Body ColdCure® wrap has many uses for different areas. For injuries in the back, neck, abdomen, hip, leg and shoulder areas, the Large Body ColdCure® wrap can aleviate pain and reduce swelling over these wide areas. It can also provide coverage for larger waist sizes for those looking to treat their back, hips or abdomen. Large ColdCure® Body Wraps can fit anyone for non-back use, and for backs are guaranteed to fit comfortably on anyone with a waist measuring between 22'' and 44''. 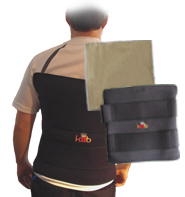 For people whose waist measures below 22'' we recommend using our regular ColdCure® Back Wrap for your injury. For people whose waist measures above 44'' we have extensions that can be included with your wrap that you can attach to achieve a perfect fit. Only ColdCure® Wraps come with RigiGel® gel packs. RigiGel® is unlike any other gel pack formula. The unique technology of RigiGel® makes it soft and mouldable to the touch, yet unyielding under pressure. RigiGel® moulds to the exact shape of your body, but doesn't flow out of the way when pressure is applied. While other gels will move under pressure, RigiGel® stays in place. This results in effective, uniform treatment of pain and swelling in the area of injury. Large ColdCure® Body Wraps come with two massive gel packs. These gel packs are even larger than in our other wraps, which are already significantly larger than regular store-bought packs. While you are using one of these massive gel packs you always have another one charging in the refrigerator. We have combined our advanced and superior gel formula with our largest gel packs yet. Our gel formula stays cold longer than other gels. This means your treatments will last longer and you won't have to switch out packs from the refrigerator as often. Two massive gel packs, plus a superior gel formula, equals up to 10x more cooling power than other products. And 10x more cooling power means faster relief from pain and swelling. ColdCure® Wraps are made of soft, flexible Neoprene that conforms perfectly to your body. Even the stitching is flexible, so when you move the wrap moves with you. The inner lining of the wrap is thin and breathable. There is no bunching or binding which means treatments are very comfortable. Adjust the wide Velcro® straps to find a fit for your unique body shape. Gel packs stored at refrigerator temperatures can be used inside your wrap continuously. Treatments can be cycled back-to-back with no waiting in between. Gel packs stored at freezer temperatures can be used inside your wrap in cycles of use and rest. Treatments should be cycled in 20 minutes of use followed by 20 minutes of rest.